Five student speakers have been named for Penn Manor High School’s 2018 commencement, scheduled for 7 p.m. Wednesday, June 6, at Franklin & Marshall College Alumni Sports and Fitness Center. The speakers are Nicholas Fafel, Aniah Washington, Joshua Adams, Blake Martin and Kevin Ward. Nicholas, the son of Steve and Vicki Fafel of Conestoga, is class valedictorian. He participated in cross-country, wrestling, track and field, Science National Honor Society, Rocket Club and National Honor Society and was president of the Technology Student Association. Nick plans to study chemical engineering at the University of Delaware. Aniah, the daughter of Stephanie Stoy of Lancaster, is senior class president. She participated in soccer, track and field, Aevidum and Mock Trial and was business manager for the yearbook. She plans to study law, jurisprudence and social thought at Amherst College. Joshua, the son of Jeffrey and Monique Adams of Lancaster, is class salutatorian. He participated in the Technology Student Association and plans to attend Penn State University. Blake is the son of Curtis and Beth Martin of Lancaster. He participated in lacrosse, soccer and Model UN and was a tutor for Math Bowl. Blake plans to study biomechanical engineering at Penn State. Kevin is the son of John and Deborah Ward of Millersville. He participated in Marching Band, Percussion Ensemble, Quiz Bowl, National Honor Society, Technology Student Association, the STEM Team and Attollo. Kevin plans to study computer engineering at Stevens Institute of Technology in New Jersey. Admission to commencement is by ticket only, nine per graduate. All seating, with the exception of a reserved section for the disabled and honored guests, will be filled on a first-come, first-served basis. Doors open at 5:30 p.m. 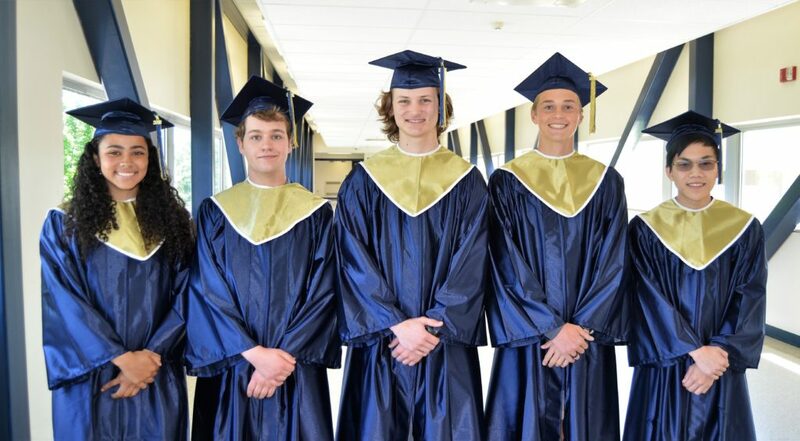 Admission tickets will be distributed to graduates at the end of commencement practice, scheduled for 8 a.m. June 4 and 5 at Penn Manor High School. Baccalaureate is at 7 p.m. May 31 at Pequea Church. Seniors may also participate in a “Senior Walk,” a procession through the halls in their caps and gowns at the elementary school they attended, on Tuesday, June 5, from 2:30 to 3:15 p.m. PLEASE NOTE: Commencement is a formal ceremony that marks an important event in each student’s life. For this to occur, we need the cooperation of the Class of 2018 and each person in the audience. During presentation of diplomas, please refrain from cheering or making other noises that will make it difficult to hear student names. Once all students have received their diplomas, attendees may celebrate. Commencement speakers are, from left, Aniah Washington, Joshua Adams, Blake Martin, Nicholas Fafel and Kevin Ward.